Mustard seed oil is made from the seeds of the mustard plant, a cruciferious vegetable in the same family as Brussels sprouts, cabbage and broccoli. Mustard seeds, and their oil, have been used medicinally since ancient Greece. According to the World's Healthiest Foods website, mustard seeds are high in omega-3 fatty acids, selenium, phosphorus, magnesium, manganese, zinc, calcium, iron, protein, niacin and fiber. 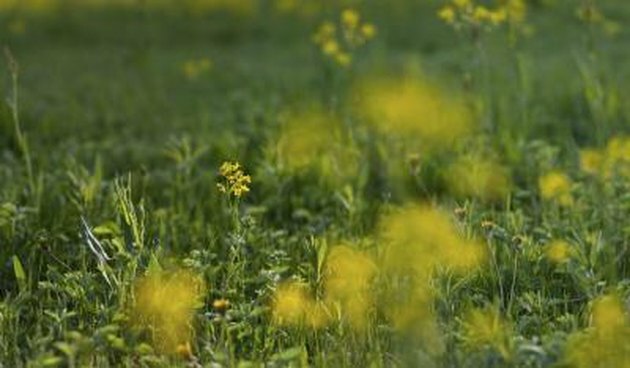 Mustard seed oil is high in selenium, an antioxidant that protects cells against environmental damage, says the National Institutes of Health. Antioxidants make hair stronger and help prevent hair loss by preventing free radical damage. Mustard oil contains protein, the major component of hair. According to an article published in "USA Today," protein is essential for hair growth and inadequate amounts of protein can lead to "massive hair shedding" because your body will divert the small amount of available protein to critical body functions and divert it from your hair follicles, which will enter a resting phase. Consuming more protein, which may include mustard oil, will help regrow hair. Mustard seed oil is high in omega-3 fatty acids that help your hair grow faster and more healthy by nourishing your hair from the inside, encouraging your hair to grow thicker, stronger and shinier. Massage mustard seed oil into your scalp and cover with a warm towel to help the oil penetrate into your skin and hair follicle. The oil and the massage will stimulate blood flow to the scalp which may accelerate hair growth.